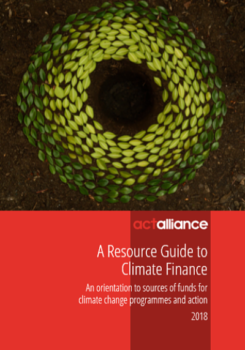 ACT Alliance is pleased to share our new Resource Guide to Climate Finance: An orientation to sources of funds for climate change programmes and action. It is available in English and Spanish. Ambitious climate action in developing countries depends on the mobilization and accessibility to financial resources. Climate finance is important for mitigation efforts, to reduce greenhouse gas emissions and also for adaptation, to support communities in adapting to climate change and reducing the adverse impacts of climate change on their communities. This Resource Guide is designed to assist ACT Forums, members, partners, Faith-Based Organisations (FBOs), and others to identify some of the funds available within the global climate finance architecture that may be relevant for their climate-related programmes and projects. The Guide covers 25 multilateral, 16 bilateral, 13 private, 10 faith-based, 3 national, and 1 regional grant providers. It is inclusive of funds with high eligibility criteria, as well as funds that are more accessible for small, less institutionalised organizations with modest climate change project experience. The Guide explores some of the frequently asked questions related to climate funds including background information, sectoral and regional focus, eligibility criteria, application deadlines (where known), contact details and online links for additional information. Each analysis ends with a brief assessment of the relevance of the fund for ACT members as grant-seekers. It is recommended that you use this Resource Guide to complement your ongoing search for climate finance sources. We would like to encourage you to use this resource and to share it with your networks and partners. We are pleased to offer any additional support in using the toolkit. The Spanish version is available here. For any questions or comments please contact Joanna Patouris, joanna.patouris[@]actalliance.org.